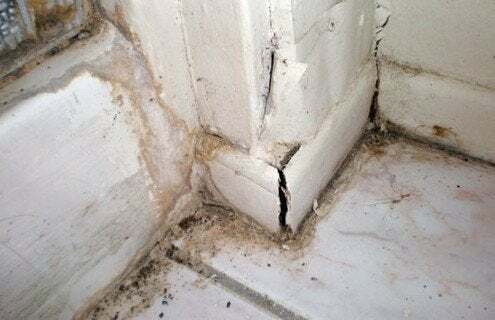 Four out of ten American homes have a mold problem. If you’ve got an area less than 10 square feet and your household doesn’t include anyone who is very young, very old or chronically ill, you can tackle the problem yourself if you’re careful, once you’ve removed the source of the moisture. Contrary to popular belief, you can’t kill mold with bleach. It might remove the appearance, but it won’t get the roots, which will re-bloom if the area stays wet. If the moisture source was clean, use a wet vac or steamer to remove wet or loose debris and double bag it in heavy trash bags. Then damp-wipe or scrub with detergent and water, but don’t soak the surface. When it’s thoroughly dry, vacuum again with a HEPA vacuum. Double-bag the vacuum contents and thoroughly clean or replace the vacuum’s filter. You can dispose of the bags with the rest of your trash. Seal off your work area, and never touch mold with your bare hands, get it in your eyes or breathe it. Wear protective clothing and shower well after you’ve finished. Check out epa.gov for pointers, and if the job’s too big to handle, hire a pro.